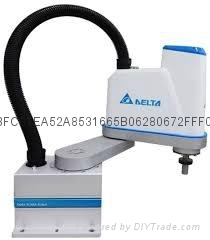 Delta’s SCARA DRS40L Series can be easily applied to the production lines in a broad range of industries. It is able to conduct complex processes such as insertion, screw locking, assembly, coating, transfer, soldering, transporting, and packaging for the consumer electronics, electrical/electronics, rubber and plastic, packaging, metal fabrication and other industries. Delta also introduced the robot control system and machine vision system to give an in-depth understanding of the SCARA robot solution.